The benefits of legal insurance for landlords and buy-to-let investors. 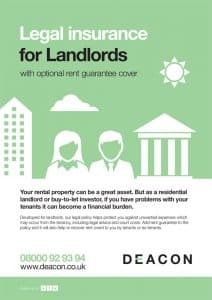 Whether you’re a buy-to-let or full time landlord, this policy can help safeguard you against missed rental payments from your tenants and any unwanted legal expenses, which may occur from the tenancy, including legal advice and court costs. For full terms and conditions please refer to the policy wording available on request.